This delicious aubergine and pomegranate salad is both crunchy and fresh, creamy and sweet – not to mention the perfect addition to any festive season feast! It will fill up your guests without being too heavy, and you can rely on its ability to wow every time. 1. Preheat the oven to 200º C (180º C, gas 6). Put the saffron in a small bowl and add 2 tsp hot water. Leave to one side. 2. Using a sharp knife, lightly score a cross-hatch over one side of each aubergine slice to allow the marinade to permeate. In a small bowl, mix the oil the the ras el hanout and garlic. Brush this mixture on both sides of the aubergine slices, then season generously with salt and pepper. Put on a baking tray and cool in the oven for 35-40 minutes until the aubergines are golden brown and have started to collapse a little. 3. In a small bowl, mix the pomegranate seeds with the parsley, half the lemon juice and the pistacio nuts. 4. Put the tahini into the bowl with the saffron water and add the yoghurt, the remaining lemon juice and the maple syrup. Stir to combine well. 5. 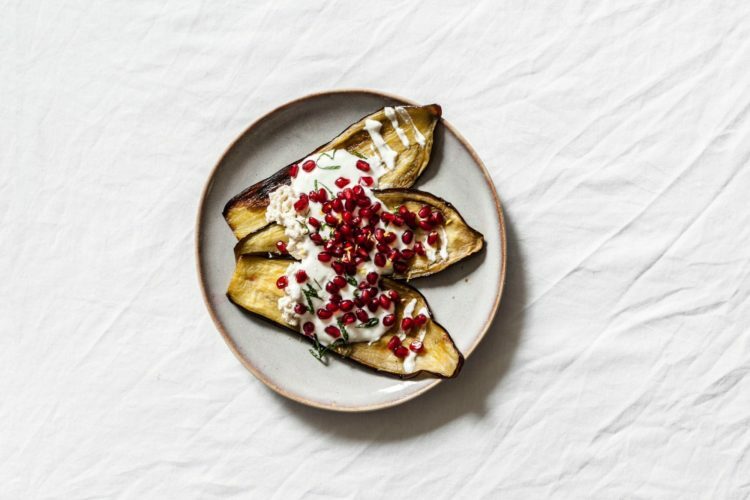 Stack the aubergine rounds up on a plate, sprinkle over the pomegranate and pistacio mixture, and drizzle with the saffron yoghurt. Top with a drizzle of pomegranate molasses to serve.